Working on Shopify stores on a daily basis there are a few things I always see time and time again. I wanted to write a blog post about the top mistakes I see people making or solutions they are not utilizing on their Shopify stores. Most of these are simple, quick fixes that won’t cost you a penny. If you have any questions or comments please feel free to leave a reply at the bottom of this post. Adding a Facebook pixel to your store is a must. Lots of people figure they will do it once they start ads, but doing it right away will benefit you in the long run by having data already collected for when you want to run Facebook ads. In order to do so, you need to have a Facebook page and ad account, setup through the Facebook Business Manager. Once you have an ad account you can create a pixel, and copy and paste this into Online Store > Preferences. Shopify guide on Facebook Pixel Setup. Another thing I see all the time is a missing product catalog. If your pixel and catalogue are not setup together you are missing out on collecting extremely valuable data and the ability to retarget customers the exact products they viewed via Facebook and Instagram. Not only that, you will not be able to tag products on Instagram without it. So make sure you have your facebook catalog setup! We recommend using the free app Flexify for the product feed which will power your Facebook catalog. They also have a great guide on setting it up. You will need to be set up on the Facebook Business Manager and can create your catalog there, also make sure you associate it with the Facebook pixel you set up previously and installed on your store. Once you have it all setup you can test it with the Facebook Pixel Helper chrome extension. Having google analytics setup is a must some people toss in a google analytics code, but do not enable it for enhanced e-commerce. Doing so will collect sales info and more data for your Shopify store which will help you determine any issues or where you’re having a disconnect with your customers. Shopify has a great guide, make sure you follow all 4 steps under the Google Analytics heading on the left menu including setting up goals and enhanced ecommerce. Shopify Guide on Analytics Setup. I often see the meta section empty on Shopify stores. This is filled in under Online Store > Preferences. The homepage title is the most important factor for SEO, make sure it’s well written. The description is also extremely important as this is what will show up on a google/web search. Read some basic SEO tips. Did you know you can manually order your products in Shopify by creating a collection, then ordering your products in whatever order you want them to display? Even for your default collections/all collection which is created by default. In order to override this by creating a collection called “All” then under Conditions select “Automatically select products based on conditions”, under Products must match select “any condition”, and lastly select “product price” – “is greater than” – “$0” this will create a smart collection for any product over $0.00 (ie: all products). You can change that value if you wish. Click Save collection. You will now see your products all added into this new collection, select Sort “Manually” and drag your products in the order you wish. This works on all collections, but I just outlined how to re-arrange your default shop all page (collections/all) collection. I see forms all the time that are not doing a thing. There is no point in having a form if you’re not collecting the data. Most themes come with a newsletter signup feature. Older themes will have a spot to insert your subscriber list url that you get from mailchimp. But since all new themes are running on Sections they got rid of that feature, so now to get your subscribers over to mailchimp simply install the free mailchimp app from the Shopify app store and sync it with your mailchimp account and follow the steps. Other email platforms such as Klaviyo will have their own sync apps as well. Connecting with mailchimp will also import other smart lists such as customers. Make sure to create separate lists ideally for each type of customer, such as opt-in, or customers so you can target them specifically in the future. Shopify does a great job at optimizing themes to load as fast as possible. The biggest issue with page load speed is image sizing, always resize AND compress your images before adding them to your store. You can resize photos in any photo editing program and I suggest using ImageOptim (Mac/OSX App – Free) or TinyPng (Online Free Web App) to compress images for web. You can also use various apps in the Shopify app store to compress your images, just go to the Shopify app store and search “compress images” most cost between $0.01 – $0.05 per image. Most stores get 60% mobile vs 40% desktop traffic. If your running Facebook ads mobile traffic can reach up to 80+%! So when setting up and designing your store, always start off by viewing the experience on mobile then make the transition to desktop. I suggest always working on a “mobile first” experience when building your website. I see so many beautiful stores on desktop, but when you view on mobile the experience or even layout gets completely ruined. Try to keep padding and extra space to a minimum and use features such as swipeable product images and reduce any excess content and imagery that is not imperative for the shopping experience. The more the merrier when talking about payment methods. Look at setting up credit-card and PayPal as an absolute minimum for your store. I suggest to also setup apple pay, and payments by Amazon. Giving your customers the option to use their favorite payment platform ensures confidence and can increase conversions on your store. If you’re worried about the additional 2% cost by Shopify, work it into your pricing. No one likes paying for shipping. Always have free shipping over $x as an incentive for your customer to add a few more items to their cart. If your products are very expensive to ship, work them into your product cost to reduce the shipping cost. Shipping should never be more than 15-20% of the cost of your product. Ideally set a flat rate shipping of $10 or less, as this is a number people are comfortable spending. If it means increasing your product price, then generally you will find conversions will increase even with a more expensive product because of the lower shipping costs. Every product, page, collection and blog post has a spot to insert manual meta tags for SEO. This is important and you should be doing it, I feel only one out of every ten people actually utilize this. When editing a product, page, collection or post scroll to the bottom of your page and you will see an area to edit the meta info by clicking on the “Edit website SEO” text. 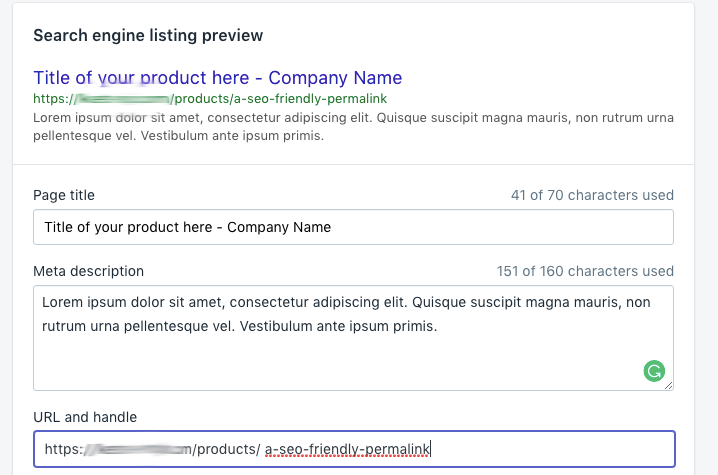 By default, it will use the title and first 160 characters from your product, page, collection or post. Optimize this for best SEO results and for better user experience. It’s OK using a sentence or two from your product description but make sure it’s readable and makes sense without exceeding the character limit. If you’re using the Shopify Basic plan or above, did you know that Shopify offers a free 60 minute block of time for theme customizations or design edits? Most people don’t. Just contact them via chat or email and inquire about this and send what you need them to do and they will look after it. Looking for help with your Shopify store? We offer full shopify and woocommerce services from design & development to marketing and website audits. Contact us today. Add to the list. Not understanding how tags work. Thanks, I think I might do another list, which is for people once they actually have their store up and running properly. Sort of like a more advanced version. Those are great (and important) suggestions. The point about image optimization is good. It surprises me how many stores have products with missing images (or those ‘no image available’ placeholders). Sometimes this is the fault of the dropship supplier. I can’t imagine buying something online that I can’t see. We created an ImageFinder app to help in this situation. I am a jewelry designer with a wordpress website with woo commerce. Do you think Shopify would be better? It depends on how things are going currently. Has your site had any major bugs, or issues? The nice thing about Shopify is you don’t have to worry about that stuff, you can focus on marketing and they have many great marketing integrations to help boost your sales. I am personally a fan of Shopify and since building my first Shopify website I have not gone back to WooCommerce unless its by request for a particular reason. Hope this helps! Good luck. Very nice article to read. The point you have mentioned above are really useful for website publishers. I would like say about your point that is ignoring mobile. As the number of searches on mobile are increasing, Google wants to serve the majority of their users. Based on mobile version of the web, Google will create and rank its search listings. So, for better user experience we need AMP version to our store. By using AMP( Accelerated Mobile Pages), publishers can create a content that is optimized for mobile and capable of loading anywhere instantly. However, we won’t get this version in Shopify but we can use the additional feature of it in SEO Doctor Shopify app. Next Post (n) You've launched your Shopify store, now what?